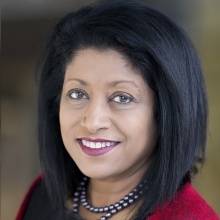 Dr. Gaya Gamhewage, is head of Support for Response in the Infectious Hazard Management department of WHO’s Health Emergency programme, based at WHO Headquarters in Geneva, Switzerland. A medical doctor by training, she currently responsible for cross-cutting interventions for epidemic and pandemic response. Dr. Gamhewage has more than two decades of experience in public health including 15 years at WHO. During the H1N1 Pandemic in 2009, she led the risk communication operations at global level, and was later head of corporate communications and risk communication capacity building. She leads a programme that supports governments across the world build sustainable risk communications capacity as required by the International health regulations (2005), the Pandemic Influenza Preparedness Framework and for integrating risk communication in all outbreak response work. She lead the development of WHO’s first-ever evidence-based guideline on emergency risk communication and has published several articles on the practice of risk communication in the21st century. She also has experience on academia, ministry of health, international NGOs and community-based organizations. For the international response to the Ebola Virus disease (EVD) outbreak in West Africa 2014-2015, Dr Gamhewage was assigned to coordinate all Ebola-related training for the international response under UNMEER. She leads risk communication and community engagement work at global level for WHO’s responses to Zika and Yellow Fever. She currently serves on the WHO Guideline Review Committee. A medical doctor by training, Dr Gamhewage holds an Executive Master in International Negotiation and Policy-Making by the Graduate Institute of International and Development Studies of Geneva and has qualifications in public health as well as conflict management, negotiation, advocacy, social marketing, adult learning and medical teaching, evidence-based decision-making, human rights programming and global health studies.